Walk almost any street in Paris and you will be connected to a historical person or event. It is the French way to give streets and public places the names of important people and significant moments in the country’s past, but this policy is almost never neutral. A good example is the Place Kossuth, where a once important building is situated. This is the story of that building and an attack by nomenclature. It was a reader, Isadore, who drew my attention to the tale. The building, a distinctive Art Déco construction on the place Kossuth in the 9th arrondissement was familiar to me, as was a vague sentiment that it had played some important role in the not too distant past. Isadore challenged me to find out more, suggesting that it had been "associated with movements from opposite extremes of the political spectrum in its heyday". Isadore clearly knew more than me, but his prompt set me on a search. What I uncovered is fascinating, justifying Isadore’s suggestion that it would be “well worth writing about this very eventful place”. It also feels though as if I have only scratched a very thin part of the surface of this particular location. I would be tempted to begin at the beginning, but with this building it is difficult to find a start point. 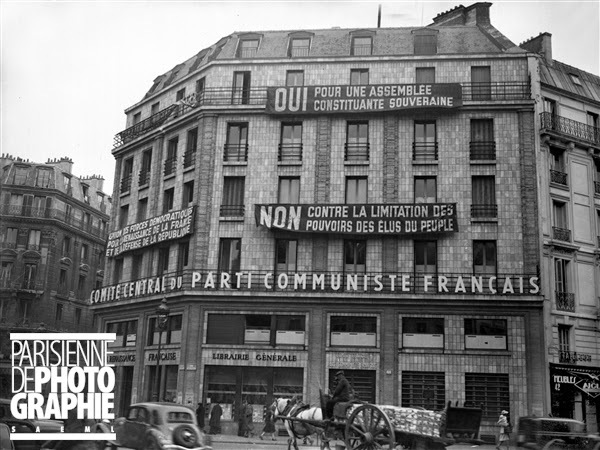 What is clear is that it first came to prominence in 1937 when it became the HQ of the French Communist Party (PCF). What it was used for previously or how it looked is not noted, but the political organisation did launch major refurbishments after purchasing the site, perhaps primarily for security reasons. Security was understandably something of an obsession for the organisation. Their previous HQ had been in a much smaller building near the Gare du Nord (more on this building in a future post), but almost no records exist of this period, and this for a simple reason – all documents relating to the functioning of the PCF were automatically sent to Moscow. With tensions rising across Europe and the size of the party increasing in France, it was perhaps understandable that they should be careful. 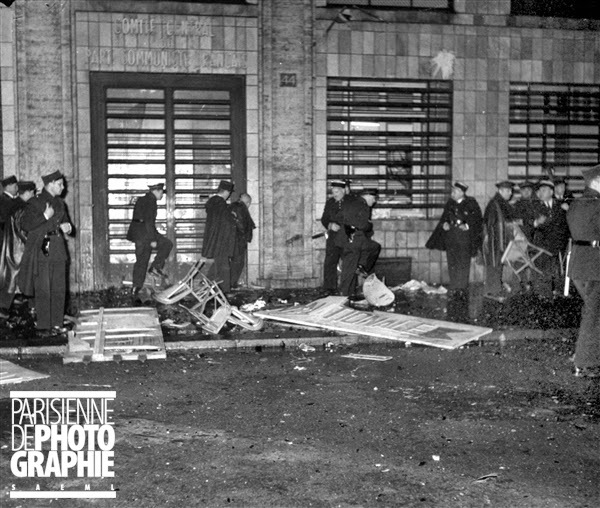 On the inside of the new building (now on Place Kossuth, but originally at n°44 Rue Le Peletier), young militants were posted like soldiers, carefully controlling anyone who attempted to enter the site. On the outside, police forces were constantly present, making notes of all the comings and goings. When war broke out and Paris became an occupied territory, the building became a symbolic citadel to capture. 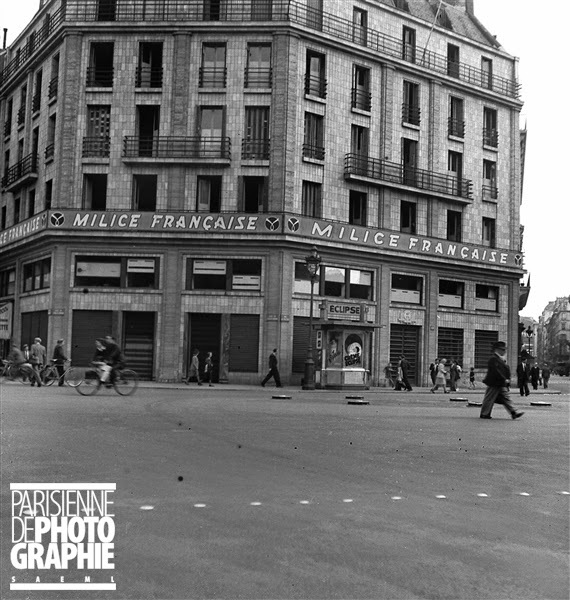 The communists were booted out, and in 1943 it became the headquarters of the Milice française, an anti-communist paramilitary organisation charged by the Vichy government with combating resistance movements in France. This dubious chapter lasted the length of the war in Paris, but once the city was liberated, the building also found its liberty - not though before a number of small battles that cost the lives of several young communist militants. By 1945, the PCF had returned ‘home’, but the beginning of the cold war made the building more targeted - and protected - than ever. On 18 juin 1946, a march in Paris celebrating the 6th anniversary of De Gaulle's famous 'appel' from London degenerated into an attack on anyone considered to be 'anti-French'. The number one target was the PCF, and the mob quickly surrounded the organisation's HQ. For the PCF, these were 'fascists', the remnents of the Milice with certain scores to settle. The newly reclaimed building was poorly defended, and the crowds broke through the entrance and into the ground-floor bookshop. According to PCF reports, they emptied the shelves of books (French and international 'classics') and burned them in the street outside. The police arrived shortly afterwards and the mob moved away, but the site remained a potential flashpoint, something that was demonstrated once more in 1956. The spark this time was the Hungarian uprising, a popular movement which was strongly opposed by the heavily Stalinist PCF. Sentiment in Paris was largely in favour of the Hungarian revolutionaries, and there was considerable anger in the city about the PCF stance. With the Hungarian protests being suppressed by the invading Soviet army, a Paris mob once again headed down to the Rue Le Peletier. This time there was a real riot, an event that was captured in the press and on film (here and here). The building was now much more heavily defended, and the PCF ready for such attacks. The crowd below threw paving stones at the building and lit fires whilst those barricaded inside threw down furniture and any other objects that could be spared. It was a similar situation at the nearby offices of Communist newspaper L'Humanité. In one account of that battle it is said that a carefully aimed bust of Karl Marx stopped one of the building's attackers in his tracks! Once again the police finally put an end to the troubles, but the largely right wing city of Paris would have its revenge shortly afterwards in a far more insidious manner. The authorities could not get inside the building and could do little about its appearance (it regularly displayed contentious messages on its facade), but they did have one power - they could change the building's address. Still considered a punishment and a humiliation today by the PCF, the building's address was changed in 1957 from 44 Rue Le Peletier to 13 Place Kossuth. The space in front of the building was previously simply known as the 'Carrefour de Châteaudun', but the name Kossuth - in honour of a 19th century Hungarian hero - gave it a completely different signification. In many ways it was the beginning of the end for the building as an important location. Although mutual spying and provocation continued throughout the 1960s, the PCF began looking for a new HQ building - and a more suitable address! With France claiming one of the largest Communist parties in the western world - with several members of parliament and numerous towns under its control, notably in the 'red ring' around Paris - they also needed larger offices. 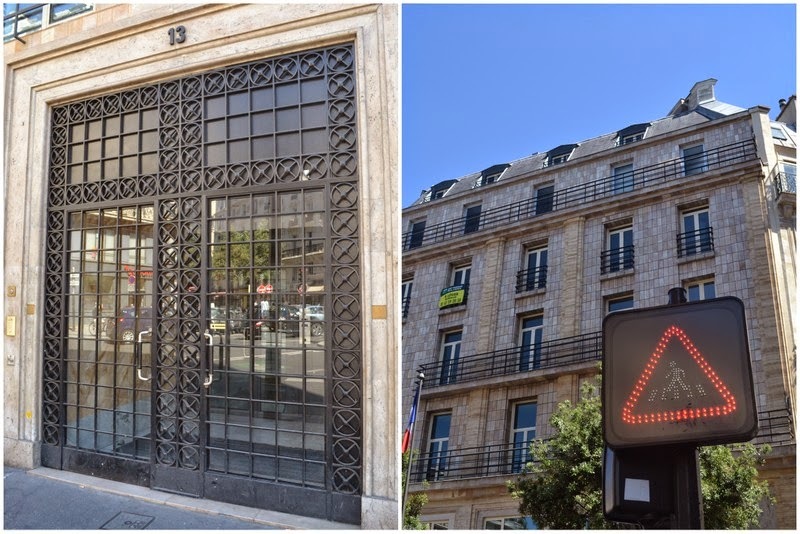 The party eventually moved to their current - and spectacular - Oscar Nieymayer designed offices (which I have written about previously on this blog) in the 19th arrondissement at the beginning of the 1970s. The address? 2 Place du Colonel Fabien, the nom de guerre of Pierre Georges, a militant communist and resistant who fought for several years against the milice française during the war. 13 Place Kossuth is still standing (with its number now proudly displayed above the door), but today it is a far more discreet presence, despite its unusual tiled facade. In a further ironical twist, its most visible occupier today is a bank (the Turkish Isbank). A final victory for capital over radicalism in this ever-more bourgeois district of Paris? This demonstrates my ignorance of Hungarian history, but what was it about the name of Kossuth that was so repellant to the Communists? An excellent question Philippa - and I apologise for not attempting an answer in the post. I think above all the problem was the enforced change of address. For Communist militants, the HQ was known as 'le 44', so this decision took away a part of its identity. During the Hungarian uprising, Kossuth - a leader of a previous revolution in Hungary and a man who fought to establish a Hungarian identity - became an important symbol, so by extension a figure of anti-communism in this period. The PCF though had no problem with Kossuth as such. Whilst he was not one of their idols, he was nevertheless a revolutionary. As the militant communist and author André Wurmser wrote in his autobiography, Kossuth was "betrayed all his life, and betrayed again a century after his death" by the decision of the city of Paris. Indeed, according to Wurmser, Colonel Fabien - communist and resistant, and also the new address of the PCF - was "a hero who was much closer to Kossuth than his unexpected admirers (in Paris)". Wurmser finally points out that during Kossuth's uprising against the Habsburgs in 1848, the conservative French republic offered no assistance. Since writing my earlier comment, I have remembered that the name Kossuth touches my own family history tangentially. My great-great grandfather, Jean (or Johannes, or John) Sieber, who was born in Zurich, studied in Paris at the Ecole Polytechnique and at the Gobelins tapestry factory (he specialized in the chemistry of dyeing) and went to work in Vienna in 1848. There, he inadvertently got caught up in the battle of Schwechat. He was supposed to fight for the Austrians, but he was sympathetic to the Hungarians and to Kossuth, and at one point gave a drink to a wounded Hungarian on the battlefield. Some family accounts say that he was nearly shot for this, and in another that he was nearly court-martialled. All of which is quite irrelevant to your story, but it makes me realize I should find out more about Kossuth. Anthony - the link should be working fine now. You're right, the 'new' building is spectacular - at once futuristic and curiously dated!